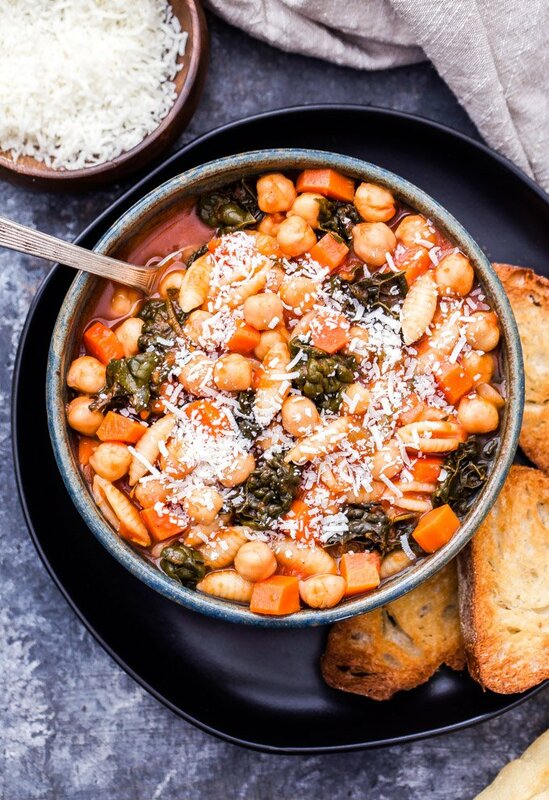 Chickpea Pasta Fagioli is a twist on the classic Italian soup recipe. 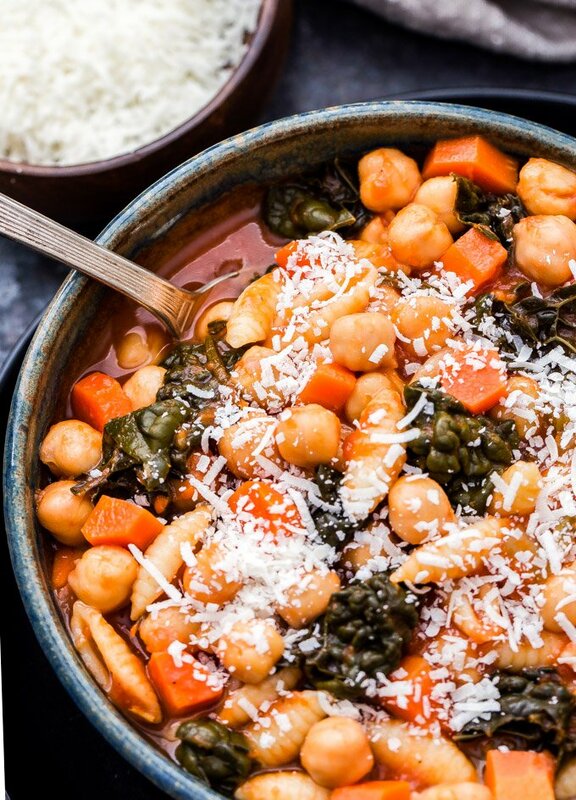 This cozy bowl of healthy comfort food is sure to warm you up on even the coldest day! I am so over winter! I suppose if I wasn’t an avid morning runner who will go out in just about any weather conditions it wouldn’t bother me so much. But the constant running in the dark, cold, snow, ice and maneuvering my way through it all is really waring on me. I haven’t fallen yet this year, but I’ve had some close calls. Most days it feels like I’m running through an obstacle course. If I separate the running aspect from everything else, I suppose winter isn’t so bad. I love sitting by the fire when it’s cold, I love how it looks when it snows (hides all the ugly brown) and I really love how a bowl of soup warms me up from the inside out. I made this Chickpea Pasta Fagioli a couple weeks ago and timed it perfectly because it happened to be cold and snowy that day. 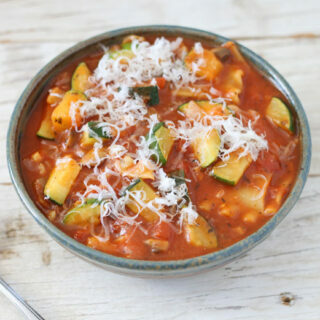 Pasta Fagioli is a classic Italian soup that translates to pasta and beans. Sounds simple and maybe a little boring, but it’s the combination of fresh and dry herbs and vegetables that make it special and add tons of flavor. The parmesan cheese doesn’t hurt either. This recipe can easily be made gluten-free by using your favorite gluten-free pasta. 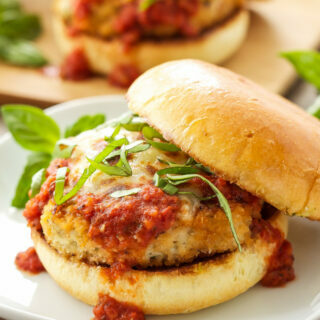 Want to make it vegetarian? Skip the pancetta and substitute the chicken broth with vegetable broth. 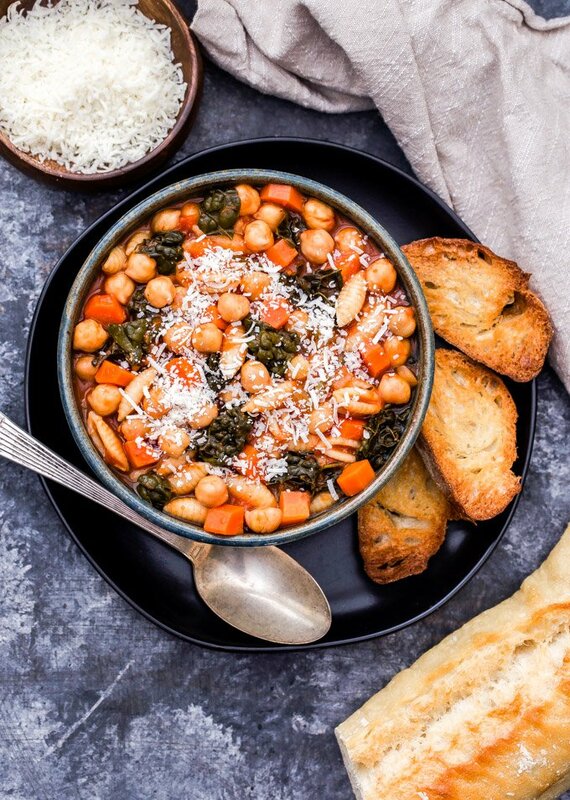 Traditionally this soup uses cannellini beans, but I had chickpeas in my pantry, not to mention I love the texture of chickpeas. Chickpeas are part of the pulses family. If you aren’t familiar with the term pulses it refers to the edible seeds of plants in the legume family. Along with chickpeas they also include, lentils, dry peas and beans. 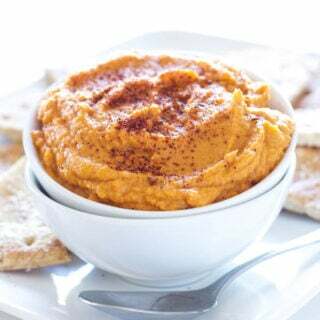 They’re low in fat and calories and are an excellent source of protein and fiber, which promotes fullness and can help with appetite control. Chickpeas in particular contain a good amount of folate, 3x that found in kale. If you’re looking for simple and affordable ways to eat healthier sign up for the Half-Cup Habit and see how easy it can be to add 1⁄2 cup serving of pulses to your diet just 3x per week for added nutrients. The United Nations designated February 10 World Pulses Day and it’s the perfect time to start adding more pulses into your diet. 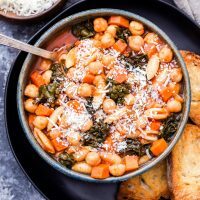 If you want to join in the festivities of the day, host a pulses potluck with friends or make this Chickpea Pasta Fagioli! Share any of your pulse creations using the hashtags #WorldPulsesDay and #LovePulses. Stay warm and enjoy! Parmesan cheese for topping the soup and crusty bread for serving. Heat a large pot over medium-high heat and add the pancetta or oil if not using pancetta. Lightly brown the pancetta then add in the onion, carrots, celery, rosemary, thyme, bay leaf, oregano and crushed red pepper. Season with salt and pepper. Sauté for 2 minutes then add in the garlic and sauté another minute. Pour in the white wine and scrape up any bits off the bottom of the pot with a wooden spoon. 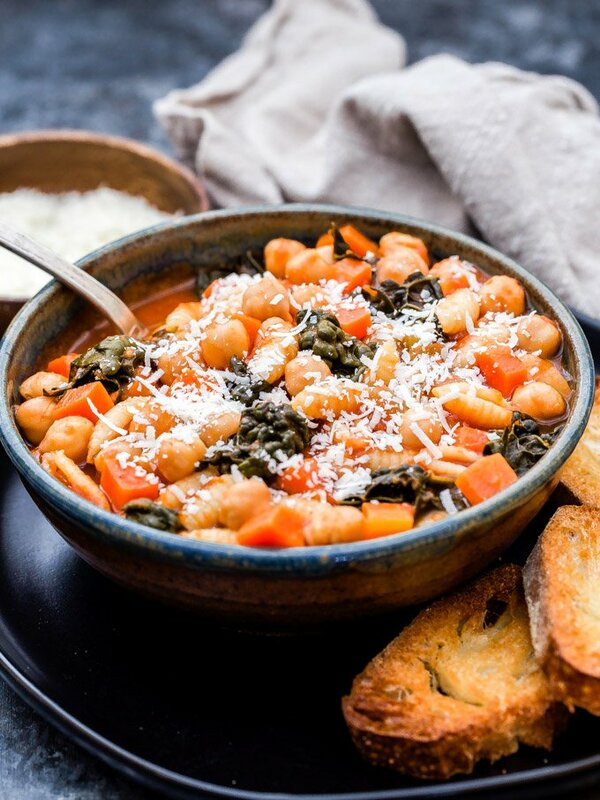 Add the crushed tomatoes, broth, water, Parmesan cheese rind, kale and chickpeas. Stir to combine and raise the heat to high. Bring the soup to a boil and add the pasta. Reduce heat to medium and cook the soup for 7-10 minutes or until the pasta is al dente, stirring occasionally. The rosemary and thyme leaves will fall off the stems as soup cooks. When the pasta is al dente remove the herb stems, bay leaf and Parmesan cheese rind from soup. Serve the soup topped with shredded Parmesan cheese and a side of crusty bread. If you aren't using pancetta replace with 1 tablespoon of olive oil.